The brethren of Lodge of Harmony No 220 along with their guests met at their regular meeting to celebrate 50 years membership in Freemasonry of David George Gale at Garston Masonic Hall. On this very special occasion they were honoured by the presence of Assistant Provincial Grand Master Derek Parkinson who was accompanied by Assistant to the Provincial Grand Principals Sam Robinson. They were joined by group chairman John Murphy, group vice chairman David Atkinson, Provincial Grand Steward Phil Brown and on his final Craft duty, Provincial Deputy Grand Director of Ceremonies Mark Barton. Lodge master Gary Mason (who is also Garston Group Secretary) welcomed Derek and was pleased to offer him the gavel of the lodge which was accepted by Derek who then took the master’s chair. Derek explained that the main purpose of the evening was to honour David’s 50 years in Freemasonry and asked that David be seated in front of the master’s chair. He continued by saying David was born on Tuesday 3 October 1944 the same year that had seen the allied invasion of France, the D Day landings and the first V2 rocket attacks on London. Derek also said it was in that same year that the PAYE tax system was introduced. As you would expect, that brought an appropriate response from all those present! When talking to David in advance of the evening, Derek said he had been able to tell him about his mother and father, Phyllis Houghton and Frank Gale. It had taken Derek some time to find out much about them, particularly David’s mum because she was christened Gertrude Phyllis Houghton. Her dad Enoch was a boatman at Garston Docks working with the docking and undocking teams. David’s grandparents, Alice and George Gale originally came from Nottinghamshire. They had three sons, Cyril, Gerald and Frank and they lived at 27 Lugard Road in Aigburth but moved just before the war to 11 Enfield Park, not far from Liverpool Cricket Club. He continued by stating that David’s father had worked for the dock board as an auditor checking the books, not just locally at Garston, but he travelled to many of the fishing ports such as Fleetwood and Grimsby to do their audits. When David was 19 years old he joined the Special Constabulary and was promoted to Sergeant. He was a member of ‘A’ Division working in the town centre out of Hatton Garden Police station until it moved to St Anne’s Street. 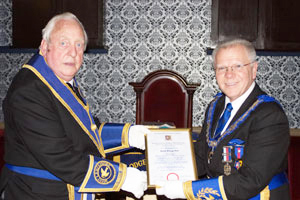 David receives his jubilee certificate from Derek. It was a busy time for David in the mid 1960’s but one day he went to a Spinners Concert in Liverpool and met a lovely lady outside. That was the first time he had set eyes on Jean Peace, who worked for Roadcraft, the crane hire company. David asked her out again and in the first week of April 1969 they were married and went to live in New Street, St Helens. After moving two more times they moved to their bungalow in Llandyrnog where they now live. 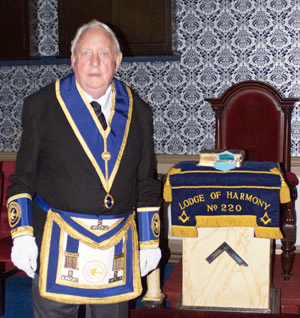 Derek stated that David’s interest in Freemasonry had come from his father and he was proposed by his grandfather Enoch Houghton with his father, Frank seconding the proposition. When David was initiated, his father Frank was in the chair and Enoch passed him to the second degree. David’s other grandfather was a freemason but sadly he died when David was two years old. With the remaining business of the evening concluded a very happy festive board was enjoyed by everyone present a ‘Chorley’ auction was conducted where over £150 was raised in support of the charities. Pictured form left to right are: Phil Brown, David Atkinson, John Murphy, David Gale, Gary Mason, Derek Parkinson, Sam Robinson and Mark Barton.